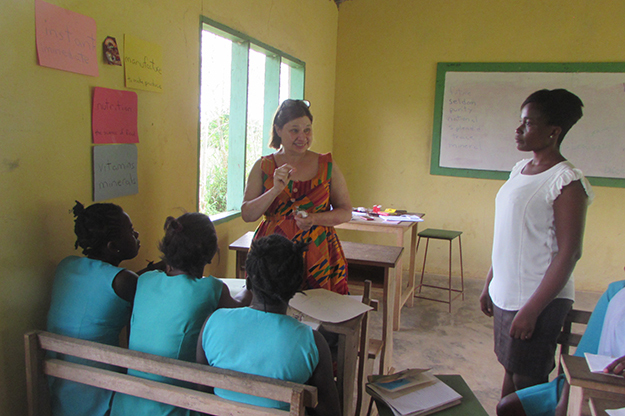 In May, Anne Walker and Michele Iiams traveled to the Moringa Community School of Trades in rural Ghana, Africa to assist teaching in English and math, respectively. They also brought components from a mechanical engineering senior design project that would help the school cook and can food more efficiently. Image courtesy of Anne Walker. Image courtesy of Anne Walker. “If you really want something done, ask North Dakotans, they’ll come through for you,” he said. Dove, a 1983 mechanical engineering graduate, recently had his relationship with UND “reinvigorated” after an experience brought multiple colleges, professors and students together to address needs a world away. 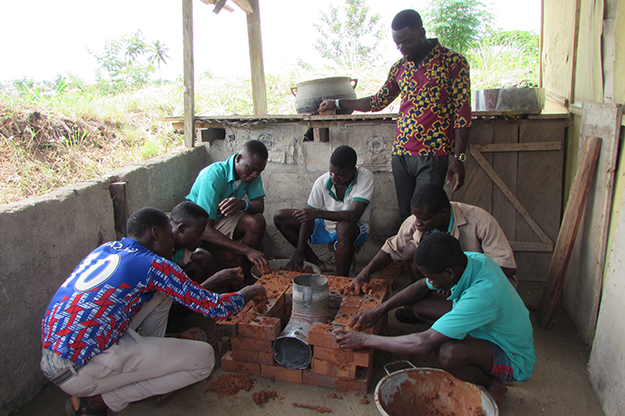 During the last school year, a team of student mechanical engineers designed, built and tested the aptly named “rocket stove.” When first built and used in Ghana, it reduced cooking time by more than half. The simple, yet effective design will help the school save on fuel costs and make food storage more viable. Image courtesy of Ben Dove. 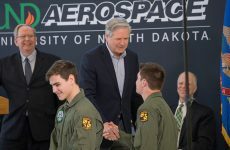 The former Vice President of Performance Excellence at Lockheed Martin’s Information Systems and Global Solutions division became familiar with UND’s senior projects in mechanical engineering after sponsoring a drone research project in 2015. In 2016, he was asked to sit on the executive advisory board for the College of Engineering & Mines. 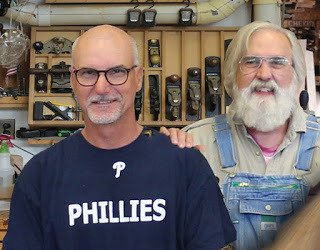 Now retired, Dove decided to pursue his hobby of woodworking – working with an expert, Jeffry Lohr, 15 minutes from his Pennsylvania residence. Lohr told Dove about the Moringa Community School of Trades. For the past decade, Lohr has worked with a rural Ghanan village to establish a technical school; a means of extending education for middle to high school-aged students, equipping them with marketable skills. As Dove became more interested in this grassroots effort, he learned of issues persisting after the school was established and operating. Given the poor economic conditions of rural life in Ghana, teachers are few and available resources for teaching are fewer. Dove says the students learn by copying whatever the teacher writes on the board – aligning with the national curriculum is nearly impossible. Food storage was another issue Dove noticed. While the area grows quality produce, villages lack the access to electricity required by refrigeration. People store food through canning, but the cost of fuel to keep water boiling and sterilize jars is high, says Dove. Deforestation is rampant in Ghana, making wood a rare commodity. Students of the trade school utilized skills they learned in masonry to construct the stove, along with instructions sent by the student design team. The design was purposefully crude and easy to replicate in places with few resources. For the first stove, Walker and Iiams brought the metal ducting elbow shown within the bricks. Image courtesy of Anne Walker. Dove became inspired to reach out to UND. There had to be a better way. “My suggestion to mechanical engineering was that there must be a better way to keep five gallons of water boiling for 45 minutes,” Dove said. The result: the rocket stove. 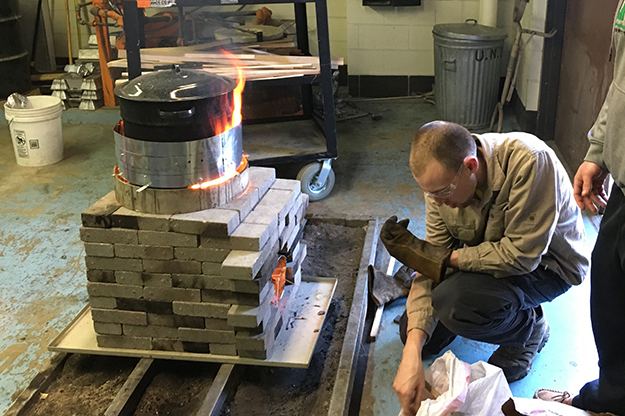 For their senior design project, a team of six students developed a stove consisting of a metal ducting elbow – bent at 90 degrees – surrounded by a shell of bricks. The shell supports the elbow and keeps the stove insulated. Its crude design was purposeful, as it needed to be cheaply replicable for viability in rural Ghana. Bamboo, a grass, is not typically used as a fuel due to its water content. If not split and treated before burning, bamboo’s water pockets expand and cause explosions. The Moringa Community School of Trades is now looking to sell a starter kit for a stove to anyone in the area who needs it, says Dove. The more people who have it, the greater the economic and environmental benefits. Walker, shown here, and Iiams brought variety to the curriculum of the trade school’s classrooms. Walker developed small-group activities and shared tools like word walls to help students learn English more effectively. Iiams worked with the school’s math instructor, and still communicates with him about teaching techniques. Image courtesy of Anne Walker. While he knew the engineering solution was well in hand, Dove still wanted to address the schoolroom curriculum – particularly English and math. He felt that someone with teaching skills going there to spend time with faculty would be beneficial. At first, he thought it would be a unique opportunity for student teachers. 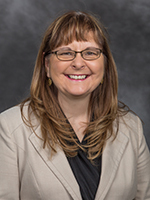 He cold-called Anne Walker, associate dean for student services and professor at the College of Education & Human Development. “I told him I’d be uncomfortable sending student teachers somewhere we knew nothing about,” Walker said. But the conversation was productive. Dove found encouragement in Walker’s interest and they met while Dove was visiting the engineering college. Michele Iiams of UND’s math department also got in on the discussion. This past May, Walker and Iiams boarded a plane and spent two weeks at the trade school. 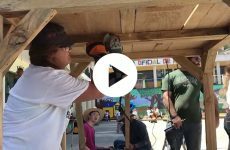 They found, as Dove described, basic classrooms with wood benches, no electricity, windows or doors, and a lone dry-erase whiteboard donated from the U.S. But they also found teachers and students eager to learn and share. When asked what it was like staying there, Walker had one word with a laugh: hot. They had the only flush toilet in the village. They also had a cold shower, a fan and weak internet. Both say they were taken care of “incredibly.” Walker and Iiams also got a taste of local living through lessons in carrying water on their heads, washing laundry by hand and mashing cassava – a starchy root – to make fufuo: a staple and dough-like food that’s made with cassava, green plantain flour and water. “I didn’t do the mixing for long,” Walker laughed, showing a photo of the activity. It’s a two-person operation, with someone driving the mix, and synchronization is key to avoid crushed hands. In return, Walker and Iiams brought their expertise and resources to the classroom. Prior to their arrival, the pair looked through the textbooks and had teachers send a two-week lesson plan in order to plan ahead. What they brought to the environment was variety. Walker got students more engaged with English through small-group activities and creating word walls. She shows another picture of Iiams engaging students in a math game. UND alum Ben Dove (right) graduated with a mechanical engineering degree in 1983. 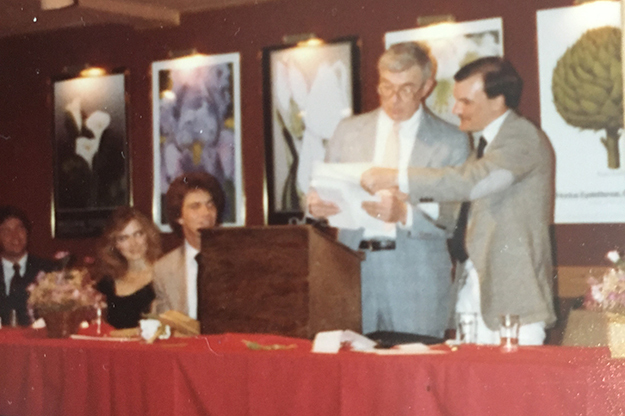 The now-retired Lockheed Martin executive shared this grainy film picture of him interacting with Professor Emeritus of Mechanical Engineering Donald Naismith, then department chair, that same year. 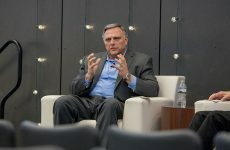 Working with the University on the senior design project and education outreach this past year gave Dove a new sense of connection to his alma mater. Image courtesy of Ben Dove. Along with their contributions to the classroom, they also carried the engineering students’ offering: the elbow duct for the first rocket stove. Iiams bought a second suitcase to bring it across the ocean. At the school, students of the building trade learned how to make bricks and arrange them, as instructed by UND engineers. Iiams says when they first used it, it reduced their cooking time to a third of what it used to be. Students at the school also learn trades such as woodworking and textile manufacturing. Their work is somewhat entrepreneurial, in that what they produce is either commissioned or sold around the community. Months have passed since Walker and Iiams left Ghana, yet they’re still in contact with the teachers. Message by message, the two work to pass skills and ideas enhancing student outcomes. Dove hopes this interaction with UND is a jump-start to making the school self-sustaining.